Goon is responsible for the legal delivery of vessels (Bill of Sale), among other things, and has been present at each delivery. He has seen the five delivery crews come and go to Gladstone. How did he experience the collaboration? ‘I have to say that an enthusiastic crew was put together for each of the ship deliveries. That is what makes or breaks the collaboration. And so… the tone was set excellently with the first ship delivery. Simply put: Frans Karmelk is an experienced captain; you see it in everything he does. We have both spent years on tankers; by then you speak the same language. The same goes for André Pilarski (chief engineer). The experience brought to the table by these maritime experts is just fantastic. They rave about their profession, are pragmatic sailors and very self-reliant. Then you know: this is going to turn out just fine. For the ship delivery crew, I had expected a young captain, but TOS had a different approach. Both captain and chief engineer are quite senior. I believe that gives a lot of peace of mind for your clients. With the problems of the fuel filters with the first delivery, for example, I didn’t hear much about it. The crew and HQ in Rotterdam arranged everything perfectly. I only needed to give approval on the financial side. One comment that has stayed with me came from an experienced chief engineer. After about half a day, he came to me and said: “Nice vessels!” That’s always fun: compliments from the work floor, from the men with experience. It’s good for the team spirit and of course, I passed it straight on to the men of the yard. The five ship deliveries went exceptionally well. TOS has contributed to making sure that we fulfilled the agreements made with the client. At the project level, the vessels were transported on time and within the budget. Even with a few problems during the first delivery, TOS met our expectations and was proactive in avoiding the same problems for the remaining deliveries,’ explains Goon. TOS was both operational manager and crewing manager for this ship delivery project. The Bremen Hunter was to begin its voyage from the anchorage of Panama City. 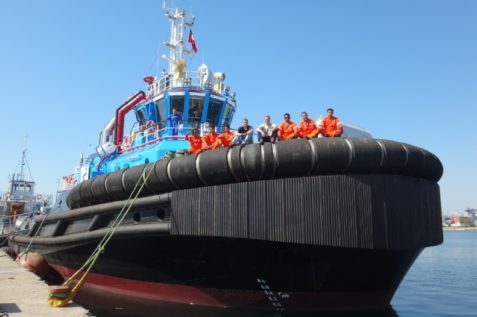 Mobilization for this project was not only to ready the ship for towing, but also to re-flag it with all necessary audits for class and flag state. Also during this period, minor repairs and deficiencies were addressed. Plans for towing were made; to be carried out on both barges upon arrival of Bremen Hunter in Hawaii were planned. In the early evening of 28th of March, Bremen Hunter departed from Panama City bound for Barbers Point Harbour, Island of O`ahu, Hawaii. During the voyage to Barbers Point Harbour, the crew continued with maintenance and prepared for the double towing job from Hawaii to Valdivia, Chile. Additionally, all obligatory drills and paperwork were completed in preparation of a U.S. Coastguard inspection. We had pleasant weather on this first leg and arrived the morning of 17th of April. After clearance by customs we underwent a full inspection, including a fire drill by U.S. Coastguard. Our preparations during the trip paid off and we received a glowing inspection report with no remarks. The next days in Barbers Point Harbour were used to ready the barges for towing. In the first days, a diving team cleaned the hull of both barges. Due to having been laid up for a long period there was much growth. The barges had to be re-ballasted. We had to lift and inspect the towing bridles that rested in the water and at the sea bottom. There was no opportunity to moor the ship in that shallow position and a mobile crane didn’t have sufficient reach. We managed to lift these chain bridles with a tugger winch and a couple of mooring lines. After the entire towing gear was ready to connect to the barges, inspection was carried out and a warranty surveyor gave the approval, it was just a matter of time to receive the provisions and fuel needed. After receiving provisions, the client had arranged for us to bunker MDO on high seas from a tanker. Saturday morning, on the 25th of April, we departed with the assistance of harbour tugs. After thanking the pilot and the assisting tugs, we paid out a towing wire and set course to rendezvous position with the bunker tanker. The next morning, around 08:00LT, we arrived at the bunker tanker; one of their crew members came aboard and we discussed the whole operation. None of us had worked in this way before with a bunker tanker, so it was good to have a meeting before we started the operation. The bunker tanker threw out a bunker hose and by towing it to the Bremen Hunter a connection was made. Once the hose was secured and connected, we continued sailing with minimum steering speed at a distance of one cable from the tanker. The chief engineer was transferred by zodiac to the tanker to check quantity and agreement of the procedure. After the chief engineer had returned, bunkering started. This operation was finished at 16:00LT and, after the final checks and agreement of the bunkered quantity, we disconnected the bunker hose and thanked the bunker tanker. The whole operation went smoothly. We set course to the island of Tahiti were we had the possibility to bunker in the port of Papeete according to the B.A. pilot books. TOS consulted our agent and then we received the instruction to disconnect and give away the barges to local tugs. We arrived 13th of May in the early morning on the road of Papeete. 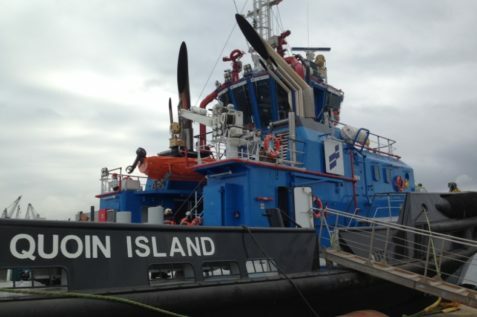 For the pilots it was an unusual job to assist a tugboat with two barges. 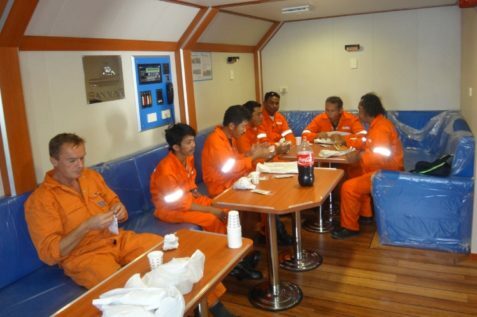 Our crew was ready; we had already discussed the job and procedure in different scenarios during the voyage. Both tow wires were shorted and we towed the closest barge in to the port with the assistance of a stern steering tug. The other barge was brought in by the harbour tugs. In the afternoon we bunkered for the remainder of the voyage. The next morning it took some time to retrieve the towing bridle of the second barge because the harbour tug had dropped it in the water after mooring alongside this barge. 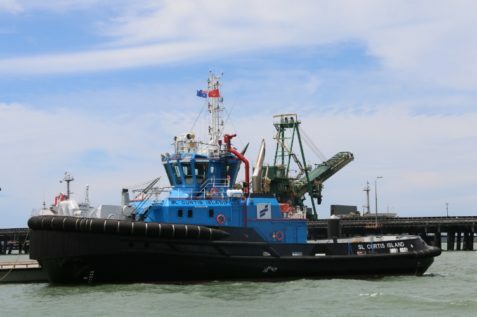 When this job was done, they gave the pennant wire to the harbour tug so that we could connect the other barge and tow it out with assistance of a little harbour tug. Once offshore, we reconnected the second barge and said goodbye to the pilot and the tugs. Monitoring the weather, currents and advice of a weather station, we decided to set course to the ESE passing Pitcairn Island and later to the Eastern Islands. The weather situation was changing rapidly as we travelled to increasingly higher southern latitudes. We decided to steer an eastern course as long as possible to still reach our destination and therefore profit as long as possible from the good weather in our area of transit. A couple of days before we passed the Eastern Islands, the tow wire of the second barge broke in the night shift. We retrieved the wire and the next morning we made a new eye on the steel wire and connected it again to the second barge just before noon. After passing the Eastern Islands, the air temperature dropped, reaching around 10 degrees Celsius during the daytime. The crew had been wearing summer outfits during the trip so far, but now even the toughest guys changed their clothes for something warmer to wear. On Monday morning, the 8th of June at 07:00LT, we arrived at the pilot station. We dropped anchor in the Bay of Corral and in the evening one of the barges was picked up by harbour tugs, the second barge a day later. The crew had a pleasant and safe voyage and their flight back home to Europe was then planned. THE FIRST TRIP WITH THE SL CURTIS ISLAND WAS FANTASTIC. The first trip with the SL Curtis Island was fantastic. After our departure from Tuzla, the first stop was to be Port Said. We reached Port Said in the morning and dropped the anchor. In the afternoon we went into the harbor, which was a unique experience. It seemed that just about everything floated by for inspection, from the police to customs and other officers feeling very important. Solution: Marlboro cigarettes. After docking, steel plates were brought on board for protection of the wheelhouse and razor wire to be installed on our voyage across the Red Sea. He travels the world over for TOS. 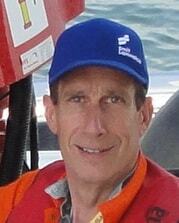 He is the contact person for both the ship delivery crew and the client. He takes care of the final details on location, readying each vessel to sail home to its new port. We are talking about Bert Timmers, Senior Consultant division Ship Management at TOS. Once the preparations for ship delivery at the office are complete (from quotation to assignment and the necessary paperwork), Bert gets to work doing what he does best. Responding to the call of the unknown: What you will encounter, what will be waiting for you, which final wrinkles will need to be ironed out, making sure the ship and her crew will have sufficient fuel and provisions for a safe and timely ‘push off’. We asked Bert how he describes his work to others. When he’s not on the job, Bert keeps it simple: ‘managing projects’. Or the even simpler pub version: ‘something with boats’. It’s another matter for those also in the maritime sector. Then Bert tells enthusiastically of great projects and the team spirit needed to ready the vessel in record time. The solutions you come up with as a team to deal with the problems that come up and to really go for it TOGETHER. Malaysia, Australia and Antarctica continue to be destinations on Bert’s wish list. Of course he can always visit there on holidays, but if you want to ship a vessel from these countries (or any other country, for that matter), then Bert Timmers is the man for the job!